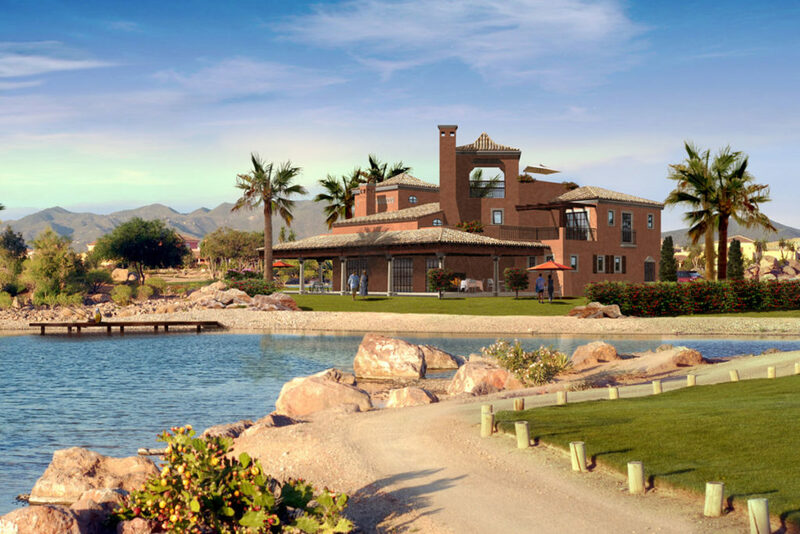 A bespoke, a la carte designed, individual house, positioned at the top of the hierarchy of homes at Desert Springs Resort. This magnificent and spacious Country House will reside in an envious position on the bank of ‘Tiburon’ lake. The main entrance to the Caprichosa is approached through a large manorial door leading into a shaded Andalucian-style courtyard, enclosed on three sides by a pergola, with a cooling central fountain. The front door entrance itself is located at the foot of a tower containing a sweeping staircase linking the entrance hall, the first floor bedrooms and an open sided torre de la vela (watch or candle tower). The tower, which has views across the lake, allows for cooling air to flow up through the property, whenever the ground floor windows are open. Below is an extensive basement and underground double garage. The property, which the owner can modify to accommodate up to six or even seven bedrooms, is designed for indoor/outdoor living. The ground floor has a spacious family living room, a semi-separate dining room and fully-fitted kitchen and breakfast room, each opening on to a covered terrace of over 1,000 sq ft. It includes areas designed and laid out for al fresco dining as well as an outdoor lounge complete with a fireplace, and for sunbathing. Also on the ground floor are a study and two of the double bedrooms. With their own semi-private entrances off the entrance hall and courtyard, they are designed as guest suites. All bedrooms have their own private bathrooms. On the first floor are two principal bedrooms, one of which is linked to the staircase by a ‘reading gallery’ overlooking the family living areas and main terrace below. Both bedrooms open on to their own private sun terraces. All floors of the property will have air management. The basement comprises 165m2 of naturally cool space, including a games room, occasional accommodation and spaces for other facilities such as a gymnasium, a spa with Jacuzzi and sauna, a wine cellar, utility and laundry rooms. The property includes a generously proportioned double garage with ample storage and workshop space. A large proportion of the energy supply for the property will be supplied by solar panels, taking advantage of the unique climatic conditions at Desert Springs. Internal finishes will be specified in accordance with the purchaser’s wishes. 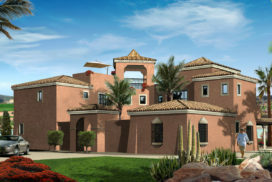 The Caprichosa will have a total internal floor area of 515m2, with terraces of 205m2. 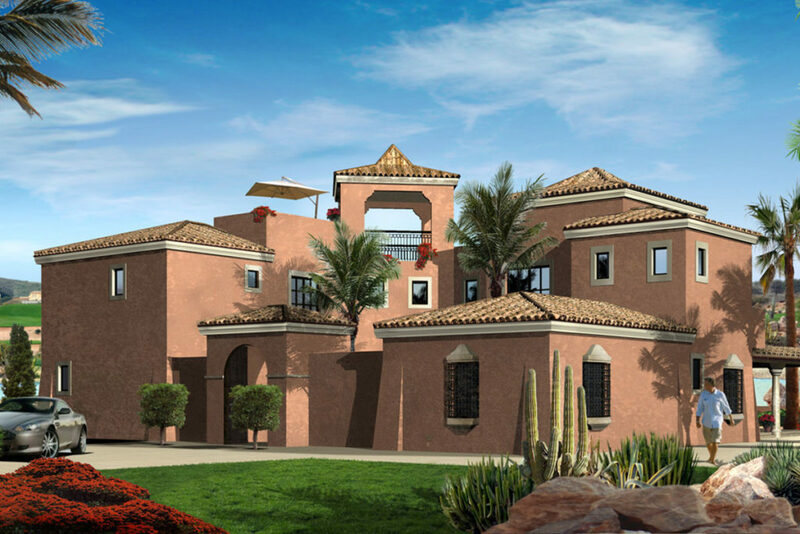 Outside the property will be fully landscaped to create the type of desert garden which resulted in the developer – the Almanzora Bay Group – being awarded the UK’s New Homes Garden Award in the category Best Garden / Landscape – Overseas Development. A 10 m x 5 m level deck swimming pool is included in the garden of The Caprichosa. Artist impression images are displayed. Prices do not include VAT/IVA; for further details of purchasing and costs please click here. Whilst availability and prices were correct at the time of posting on the site, both vary over time. The valid availability and price shall be that published on the physical price lists current when a property purchase reservation is made. This reservation then guarantees availability and fixes the price for the period of the reservation. Visiting prospective purchasers must check current availability and prices applicable for the time of their visit with The Almanzora Group Ltd before visiting.